This contest is now closed. The winners have been notified. 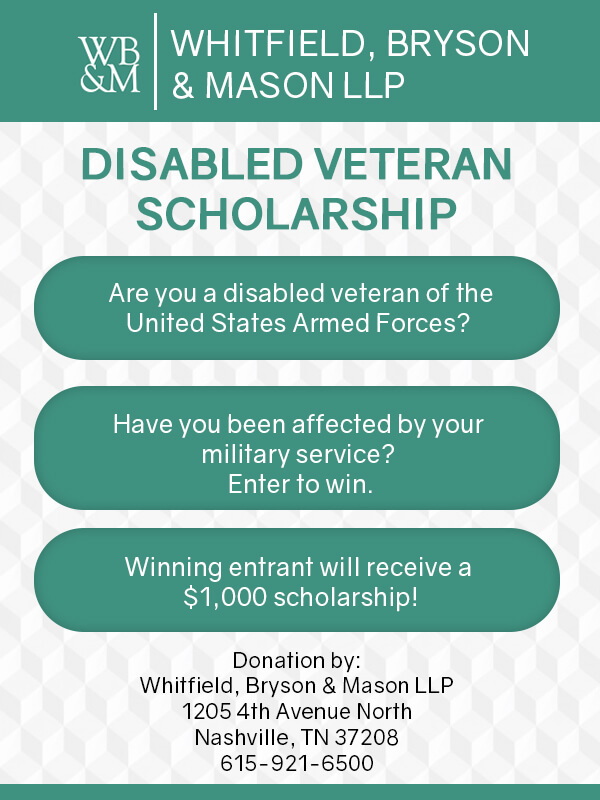 The legal team at Whitfield, Bryson & Mason LLP (WBM) is offering two scholarships for disabled veterans to help pay for tuition at any accredited four-year university. The scholarships will award $1,000 to each selected applicant. At Whitfield, Bryson & Mason LLP, we believe very strongly that the men and women who serve in our armed forces have sacrificed greatly. Oftentimes these individuals put aside their education to serve our country, but find it difficult to readjust to civilian life and return to school. For veterans who are disabled, attending college might seem like an impossible task. The scholarships offered by WBM LLP are designed to give back to those who have served to help them achieve their dreams of obtaining an education. WBM will award a $1,000 scholarship to two applicants in the form of tuition assistance at an accredited four-year college or university. Applicants do not have to be currently enrolled at a college or university at the time of application, but the scholarship must be used within one year of the award. WBM LLP will pay the scholarship directly to the school chosen by the applicant to help offset the cost of tuition. The scholarship is open to all veterans of any branch of the U.S. Armed Forces who have a disability rating of 30% or higher. Your completed application must be submitted no later than January 26th , 2018. WBM may also require (a) proof of your veteran status, (b) proof of your disability, and/ or (c) proof of your acceptance to a university. The winners will be selected at the sole discretion of Whitfield, Bryson & Mason LLP. Winners will be notified by email no later than February 2018. Any information submitted in the application becomes the property of Whitfield, Bryson & Mason LLP. We will not sell your information to third parties. However, we reserve the right to disseminate the information for the purpose of reporting and publicizing our scholarship program.